Raipur: Bollywood actress Kareena Kapoor has said that she would love to go to Pakistan to promote the education of the girl child. According to several reports, the percentage of the girl child’s education in Pakistan is very low as compared to boys. While the Pakistani government puts the overall literacy rate at 46 percent, only 26 percent of girls are educated. Independent sources and education experts, however, estimate that only 12 percent of girls are literate in the country, according to a Unesco report. 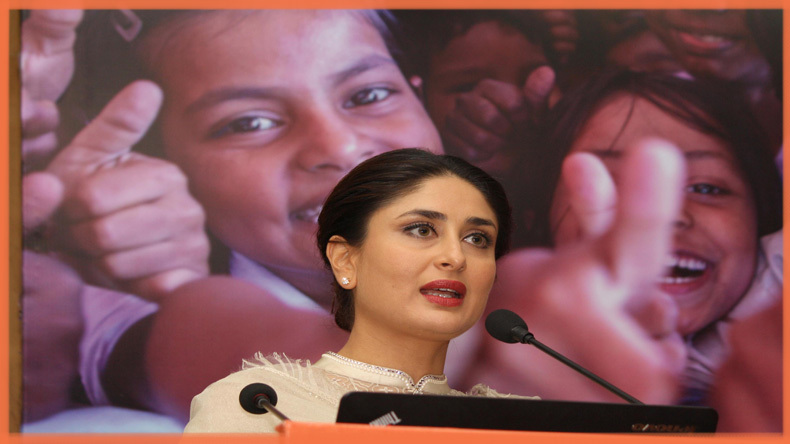 Kareena, who is also Unicef’s celebrity advocate, said late here on Friday that education was every child’s right and she would do whatever she could to promote the need of quality education for children. “There is no doubt that tremendous progress has been made in India in the area of delivering education to children. But even today, the quality of education remains a big challenge. Girls are the pride of India,” she told a gathering of over 6,000 schoolgirls at an indoor stadium here. She also urged the parents of the girls to let them pursue higher education. “I met some incredible girls of Kasturba Gandhi Balika Vidyalaya in Rajasthan who inspired me with their life stories. They highlighted their desire to complete secondary-level education. They must be appreciated and allowed to complete their studies,” she added. At the event, Chhattisgarh Chief Minister Raman Singh launched Edu-Track, an android-based application to help digitize the education process in the state. He said the app would be very useful in improving the quality of education and would also help keep track on the punctuality of both students and teachers. We would do everything to ensure that the girls complete their education, he added. “We speak about human rights, but the rights of children are also extremely important. I am confident that the efforts of Unicef, together with the government, will ensure that girl children will be inspired to complete their education, and we will be able to bring quality education to the state,” the chief minister said. He also batted for more child-friendly schools across the state wherein the students could get ample opportunities and a friendly environment for learning.